This is a new series on the site, highlighting some of the best tweets by athletes who have used Twitter as a site to further feed their already massive egos and needlessly promote themselves. Today is Chad Ochocinco. I am a huge fan of Ochocinco. Why? Because I love original characters. People who are not scared to be proud and be different. Seriously, how awesome is Ochocinco. He legally changes his name. Comes up with great celebrations and talks trash better than anyone in the league. He should sen the league offices Pepto Bismol, instead he is sending them an apology letter…. 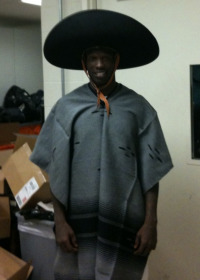 Apparently Puff Daddy told him to do this, or just “be great” which Ochocinco interpreted as putting on the sombrero. There are many concepts about Ochocinco that intrigue me. Mainly his “levels of greatness.” He has ascended to level five, not sure what this entails. He is trying to get his own brand of condoms, but he should really detail his “levels of greatness” and release a book. I guess “honeyglaze HAM” holds high reverence in his heart. Also like how often he uses “grrr” thats cute. Another concept of Ochocinco is the league wide pandemic of “H8N5” aka “Swag Flu.” Apparently Ochocinco has been reeling from it lately. This was just in the past day. Ochocinco is already in the Twitter Hall of Fame.